Lemax Nutcrcaker Suite musical table piece depicting a delightful seasonal outdoor stage show of the famous ballet "The Nutcracker" with animated Ballerinas. Two groups of ballerinas twirl and move in and out of the areas of the stage platform as the famous musical soundtrack of The Nutcracker is played out. Suitable for placement in and amongst a seasonal Lemax village Christmas scene. A real Christmas spectacle centrepiece for a Lemax Caddington Village themed display. A Lemax collectors favourite, this showpiece collectable model joined the growing Lemax Caddington collection in 2010. 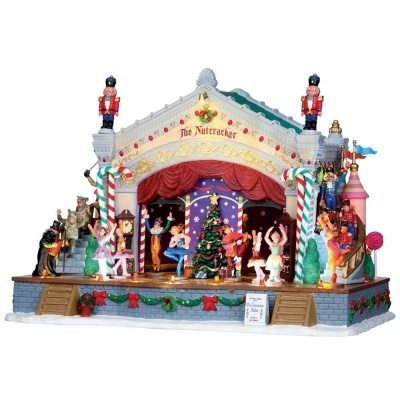 Nutcracker Suite is a 7 piece set that offers a delightful self standing animated, illuminated and musical stage show on individual base to compliment your seasonal Lemax Village.